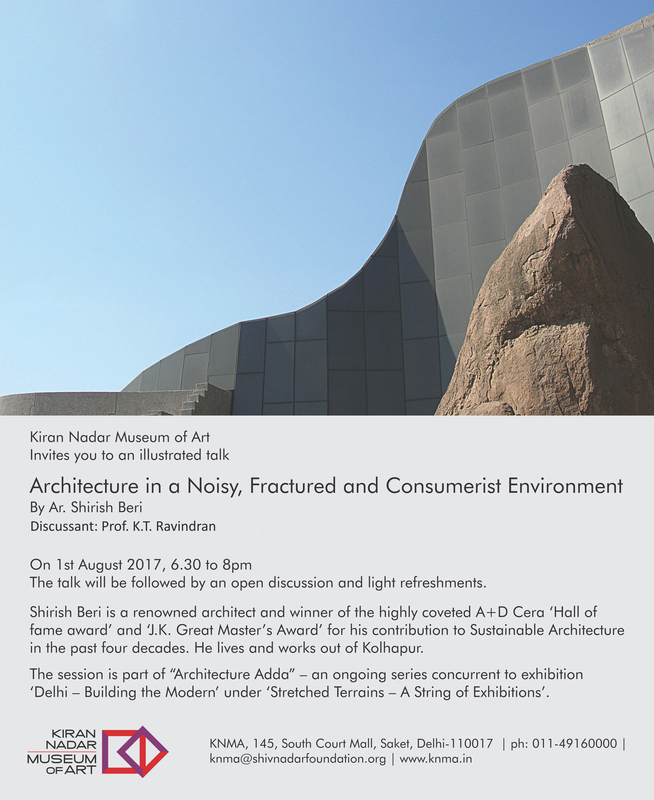 Kiran Nadar Museum of Art (KNMA, Saket) invites you to an illustrated talk on ARCHITECTURE IN A NOISY, FRACTURED AND CONSUMERIST ENVIRONMENT By Ar. Shirish Beri with Prof. K T Ravindran on 1st August 2017, Tuesday, 6.30-8.00pm. The session is part of “Architecture Adda” – an ongoing series concurrent to exhibition ‘Delhi – Building The Modern’ under ‘Stretched Terrains – A String of Exhibitions’. The talk will be followed by an open discussion and light refreshments. Ar. Shirish Beri’s works, which tend to reflect his values in life, have been bearing their distinct mark on modern Indian architecture since 1975. Through his work, Shirish Beri has probed the multisensory and the immeasurable dimension of space while trying to evoke a reflective pause amidst today’s clutter and background noise. His designs try to achieve an inherent sense of unity and harmony with various natural and man-made elements to become as sustainable as possible. He also finds expression through painting, sketching, writing poetry, photography, film and organic farming. Prof. K.T. Ravindran is a Professor and the Head of Urban Design at the School of Planning and Architecture, New Delhi for over two decades. He is the founder and President of the Institute of Urban Designers – India, which is a professional association of qualified urban designers. Ravindran has been teaching Urban Morphology and Humanizing Cities. His practice includes design of greenfield cities, cultural buildings and memorials, as well as Urban Conservation. He is currently the Chairman of the Delhi Urban Art Commission, a statutory body mediating aesthetics, environment and heritage in building and development projects in Delhi.